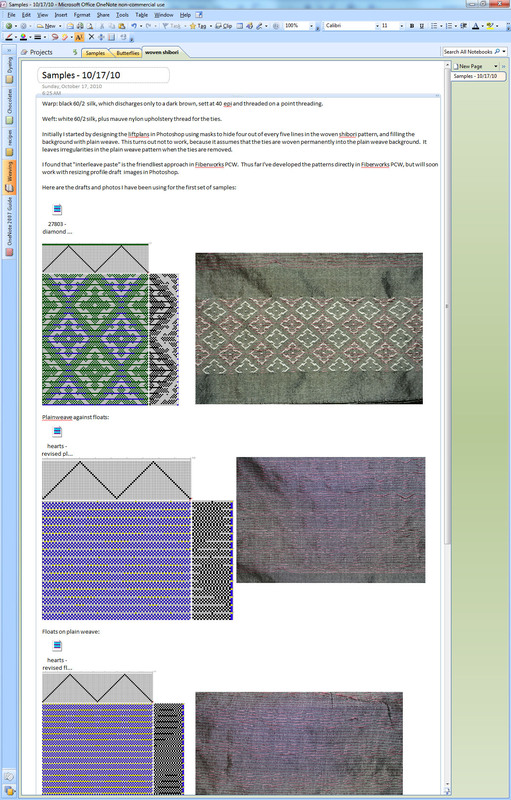 I finished weaving about a yard’s worth of samples yesterday, and thought I’d share my note-taking process with you.Â I started using Microsoft OneNote recently, after realizing I would never “get around” to making a physical notebook with printed drafts for all the samples I was making.Â And really, why make a printed notebook?Â For my work the electronic drafts (saved in .wif format should I change weaving programs later) are more efficient and better, as entering a 24-shaft, 500-pick repeat liftplan into weaving software from a printed draft would be excruciatingly painful.Â The only reason to make a printed notebook is to preserve the physical samples, and as long as I tag each sample with the OneNote notebook page it belongs to, I think I’ll be doing fairly well. I like this format a lot, especially since it keeps the drafts with the sample photos.Â I make a LOT of drafts in the process of generating the files I use (probably about 10 drafts for every one that actually gets woven), and this allows me to find the “final files” more easily. At any rate, I am going to the car dealership later this morning to get some maintenance done, and will bring the shibori samples with me so I can pull up the ties while waiting for them to finish.Â I hope to soak the samples this morning, dye them either at lunch or tonight, and to have them dry sometime tomorrow.Â For this first batch I am going to do immersion dyeing of the entire sample set.Â For the next set of samples, I may try painting with dyes or paints, so I can get different effects on “top” and “bottom” of the tied samples.Â I may also try dyeing the weft and then discharging the color in a thiourea dioxide bath, for a different color effect.Â Lots of things to experiment with! My expeience is that many woven shibori pieces are not tied tight enough and don’t resist well. My suggestion is that you gather, spray the gathers with water and then tighten again. The gathered part should be hard, no movement on the gathering thread. Immersion dyeing gives the most gradiations of color in my expeience. Then use a seam ripper to cut the gathering threads, carefully. The most common frustration is cutting the cloth when removing the gathering threads. Handwoven, resisted, dyed and then cut!!! Do it, just watch the cutting.